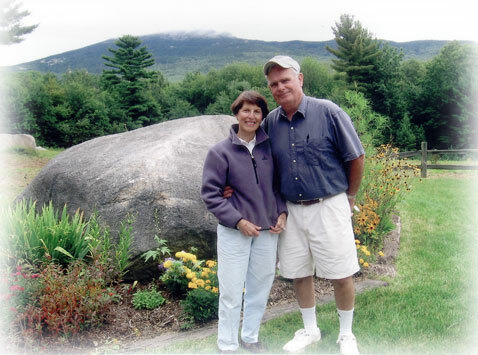 Don and Dorrie Upton built a post and beam home (Timberpeg) in 1994 at the base of Mount Monadnock with the idea of retiring there in 2001. Liking the area so much they moved there permanently and commuted the last five years to Massachusetts where Don managed a large Agricultural Cooperative. With a B.S. Degree in Agriculture from the University of Massachusetts in 1963, Don spent his life in the Northeast Agricultural Industry. The Upton’s wanted to do something unique in retirement, particularly for their children and grandchildren to enjoy, so they chose one of the oldest forms of agriculture in America. Producing maple syrup or sugaring began with the Native Americans and has grown into a large, high tech industry, but one that a small producer can effectively still compete in by producing a superior quality of syrup. They first purchased a woodlot adjacent to their home and selectively cleared it. 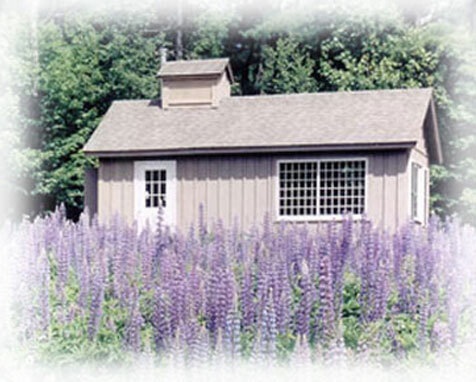 The pines were sawed with a portable mill on site into post and beams and boards for construction of the sugarhouse in January of 2004. After stacking and drying the pine, construction was completed by November and all new stainless steel equipment to evaporate the sap was moved in by year-end. After taking maple syrup production courses through the University of New Hampshire Cooperative Extension their inaugural year began in March of 2005. Two people who were very helpful in the learning process were Mark Woodard, Sugar Maker at Stonewall Farm and Dr. David Knight, friend and mentor. They use both pails and tubing to collect the sap, since Don is retired, and can boil immediately without having to store the sap, thus assuring the freshness of the final product. Don has had years of experience in food processing and is always conscious that he is making a food product, being fastidious about the cleanliness of the equipment and the work area. He feels that is the reason their syrup is recognized as the Best in New England. 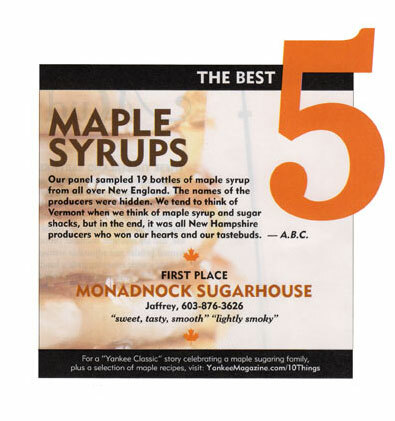 When they received the award for the Best Syrup in New England from YANKEE MAGAZINE, announced in the March/April 2008 Issue, their family felt honored and humble that all their hard work and planning had paid off. Since 2008 they have received many awards including the People's Choice Award from the Monadnock Ledger Transcript in 2009.